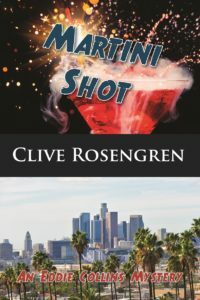 Martini Shot ($14.95, 208 pages, 6×9 Trade paperback, ISBN: 978-1-60381-760-8) is the fourth book in An Eddie Collins Mystery series by Clive Rosengren. Eddie Collins, private eye and part-time Hollywood actor must confront the promise and pitfalls of efforts toward reconciliation, in his own life and that of his client. Book 4 of the Eddie Collins Mystery Series. Clive Rosengren is a recovering actor. His career spanned more than forty years, eighteen of them pounding many of the same streets as his fictional sleuth Eddie Collins. He appeared on stages at the Great Lakes Shakespeare Festival, the Guthrie Theater, and the Oregon Shakespeare Festival, among others. Movie credits include Ed Wood, Soapdish, Cobb, and Bugsy. Among numerous television credits are Seinfeld, Home Improvement, and Cheers, where he played the only person to throw Sam Malone out of his own bar. He lives in southern Oregon’s Rogue Valley, safe and secure from the hurly-burly of Hollywood. Rosengren has written three books in the Eddie Collins Mystery series: Murder Unscripted, Red Desert, and Velvet on a Tuesday Afternoon. Books one and two were both finalists for the Shamus Awards, sponsored by the Private Eye Writers of America. For more information, check out his website. T. S. Eliot got it wrong when he called April the cruelest month. He’d obviously never been in the San Fernando Valley in mid-July. It was late Monday morning and the mercury hovered around a hundred and one as my car crept along Ventura Boulevard in search of a parking space. I could swear my teeth were sweating. My shirt had wet half moons at the armpits, testing the strength of my Old Spice. Beads of perspiration trickled down my neck, in defiance of the air conditioner that groaned like a heifer in labor. I turned onto a side street, squeezed into a gap dangerously close to a fire hydrant, then cracked the windows, picked up my photo and resume and slid into the inferno. I donned my summer porkpie. The small brim provided no help from the midday glare. Sunglasses would have helped, but while getting into my car I’d dropped my keys, bent over to retrieve them and promptly stepped on the glasses that had slid from my shirt pocket. All in all, it was starting to be one of those days where one shouldn’t even bother to take the plow out of the shed. And then I rounded a corner and bumped into Santa Claus. We mumbled apologies and continued on. I turned to see the sidewalk ahead of me filled with the jolly old St. Nicks, some in complete regalia, some not. One fellow wore Birkenstocks and plaid Bermuda shorts, but passed muster by covering his potbelly with a flaming red tee shirt. A full white beard and a red hat provided the finishing touches. I was on my way to an audition for a television bank commercial. I was to be a security guard. Obviously the Santas were there for something else. There must have been twenty of them in the waiting room, sitting in theater seats against the walls. The rest of the space was filled with carpeted benches. Interspersed with the Santas were fifteen would-be security guards, all my type. Par for the course at these cattle calls. And par for the course with respect to my pursuit of the Hollywood gold ring. I was used to it. I’m in my early forties, with a full head of hair and reasonably good looks. Yeah, perhaps a little too much paunch and traces of wrinkles around the eyes, but that’s to be expected in a character actor, one who is right for all sorts of roles, from security guard to bartender to business executive. I’ve learned to accept the fact that at many of these auditions I’m just another face in the crowd. Today wasn’t any different. In fact, only fifteen competitors were pretty good odds at landing the job. The casting office had four audition rooms, numbered appropriately. Several of my rivals wore uniform caps and shirts, making me feel underdressed. I signed in, found a seat between two of the jolly Kris Kringles and listened to them compare notes on their agents. One of my competitors, with whom I’d done a job a few years back, caught my eye from across the room. I gave him a nod and looked over the commercial’s storyboard. The gist of the ad had the guard doing a double take after seeing an old woman brandishing a pistol. Double takes I can do. Even with sweaty armpits. A reedy young woman opened door number three and called out, “Eddie Collins.” As I doffed my porkpie she ushered me into the room and I stood in front of a bored director and two somnambulating clients. I double taked my heart out, but I must have been under-whelming. They gave me the impression I had interrupted their day. I signed out, wished one of the Santas good luck and headed for the front door.